Dual Space is an app for android that allows users to clone and run multiple accounts of the same app simultaneously on one device, and also enables users to create their customized space. 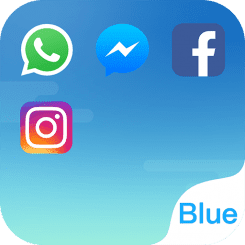 The Fresh Blue Theme for Dual Space allows you to customize the Dual Space icon and replace the default theme with beautiful blue wallpapers and skins. Custom Design: Background of homepage, Action Bar, button and etc. Dual Space is an app that provides natural & separate virtual environment for Android users to clone and run multiple accounts of the same app simultaneously on one device, and also enables users to create their customized space.